The nib comes in 2 pieces, it is designed to be easily cleaned. 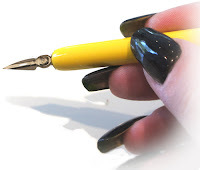 There is meant to be a split down the centre of the large nib, this allows the paint to flow onto the nail. There is meant to be a hole in the nib, make sure the smaller nib does not cover this hole. The paint your using needs to be as thin as single cream. If you have bought the be creative paint, and it is too think, add some water until the pot is full. You are not using enough pressure, this is a pen not a brush, hold the pen at a 45 degree angle...much like a writing pen, and to achieve more pressure squeeze your fingers. Practise on paper first to achieve your flow. Scratch back and forwards to generate movement for the paint to flow. Your paint has dried onto the nib and creates friction, preventing the flow. Can I buy a new nib? Yes you can, you can get the new nibs at www.sambiddle.co.uk. How do I clean the pen? Simple wash the nib and pen in water, swirl it around and remove. TOP TIP, when your finished using the pen, dip the nib in washing up liquid or dish soap. leave to one side to dry. do not rinse. the next time you use it this will act as a lubricant for your paint.